Today’s entry is in the running for the all-time best political humor. It surpasses the GM Obummer car, though it probably doesn’t quite beat out the Iowahawk video of the Pelosi GTxi SS/RT. Think about the image below as part III of the anti-libertarian humor series, with Parts I and II here and here. If we number the images so that the first row is 1-4, the second row is 5-8, etc, my favorites are 1, 7, 15, 16, 22, and 23. If I had to identify myself, I’ll admit to 16 and 22. 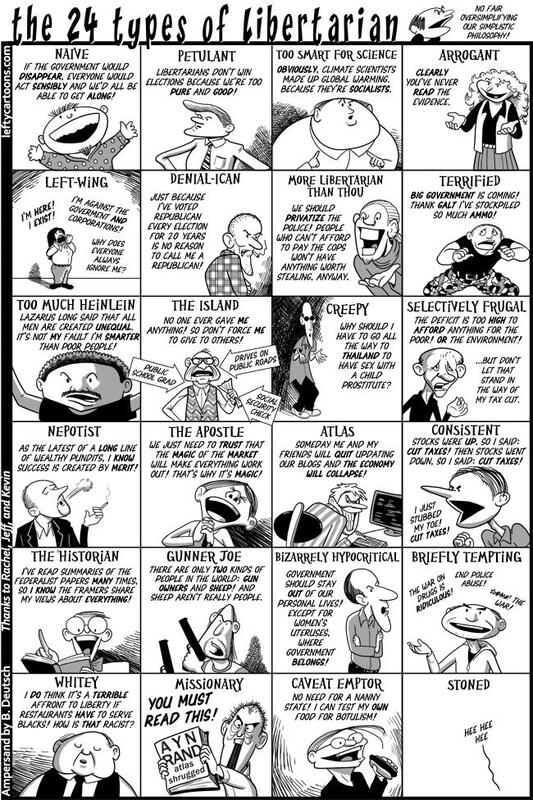 The person who put this together obviously knows libertarians, though I think 4 and 13 don’t apply to libertarians any more than they apply to other political/philosophical groupings. I also think 12 is wrong because libertarians are frugal in that they want to keep their own money and reduce the burden of government, so there’s nothing selective about their frugality. And 19 is wrong because libertarians generally agree that one of the few legitimate roles of government is to protect life, liberty, and property. They’ll disagree about whether abortion is the taking of a life, but there’s nothing hypocritical about some libertarians being pro-life. But other than that nitpicking, I’ll admit this is very funny. One last thing. If there are libertarians who fit into category 11, I hope there are more people like this Spanish mother. Dan, International Liberty is an excellent source for good information and reasons for less governmental interference in our lives. A suggestion: get an address for it, like: InternationalLiberty.org or .edu. I believe it would be more popular than under: danielmitchell.wordpress.com. Hi- the “selectively frugal” picture is #12, not #13. I find 19 hilariously funny, since the same exact point on the same exact issue fits Democrats quite well. “You will do EVERYTHING the way we want it, except for what you want to do with your uterus – you get to choose that.” Heck, with ObamaCare, that’s even more true than it was before! Personally, I’d be a 6, 12 and 16. Of course, I think 12 and 16 are really the same issue (every tax cut in my lifetime has INCREASED revenue… so why can’t we agree on that? The Democrats say that they want tax increases for the increased revenue, after all…), and 6, well, I compare voting Republican to voting for a punch in the eye… and voting Democrat to voting for a hit in the head with a sledge hammer. Sure, they both stink, but if you had to choose, it’s a pretty darn easy choice, eh? I’m a 9 and 18 myself. Dan, I don’t think I’ve ever seen a more comprehensive description of libertarianism. This was truly enlightening. #10 “Island” is problematic for the same reason “You didn’t build that,” is problematic. We didn’t pay for our Social Security? I thought that’s exactly what it was. And we didn’t pay for the roads? Or schools? I’m pretty sure we do. And, finally, “gave” has no place in this. No, we each paid for a part of them. Libertarianism (and I know that’s what they’re riffing on) doesn’t mean people don’t value cooperation. Quite the opposite. It’s being forced to “cooperate” (or “invest in the future” as a politician would put it) that I take issue with. One of the things that makes it so funny is how much research they put into it. It’s definitely one of my favorite pieces of Libertarian-aimed humor. I can see myself 16 and 21. Excellent! I quite agree with Quentin Langley, as do my friends Mike, Wyoh, Prof and Mannie. Statist: “A woman’s birth canal is a treasured gate. That is when every new citizen passes from conservative control to liberal control”. There is also no conceivable meaning to the phrase “too much Heinlein”.